On a game over, instead of reducing hearts to zero, the number of hearts is cut in half. 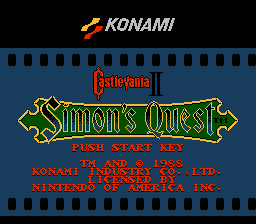 V1.1: An additional .ips file is now included which is compatible with Bisqwit’s Castlevania II Re-translation (+Map) patch. V1.2: Fixed a game-over crash in the previous compatibility update. It is fully functional and I think that all of us who have played the game agree that the game should be like that from the beginning. Totally recommended.